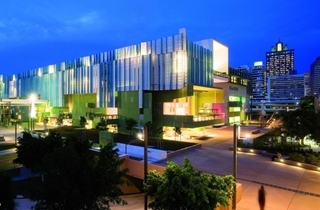 Ideally located on the river in the scenic cultural precinct of South Bank, SLQ is a central and convenient location for your wedding celebration. Set amongst a wealth of captivating art and architecture, against a backdrop of the city skyline, the award-winning building and surrounding area offer both sophisticated and quirky photographic opportunities to capture the spirit of your wedding day. The experienced events team will work with you to design your special day and make your vision a reality. Ceremony and reception packages offer a perfectly designed option to ensure you can focus on the special moments of your big day. Whether you are planning an intimate gathering or wish for a space to invite all your family and friends, SLQ venues promise to provide an unforgettable backdrop for your dream wedding. 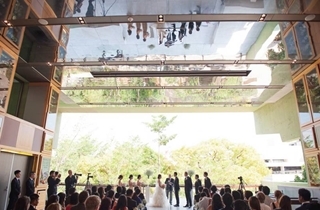 This architecturally celebrated venue offers a unique and memorable setting for your wedding reception. The venue takes advantage of Queensland’s climate, bringing the outside in and providing views of the city and surrounding greenery. A stunning and versatile covered function space, the Queensland Terrace features exquisite 6 metre high mirrored ceilings, Chillagoe marble floors and Tasmanian oak cabinets displaying a remarkable collection of tea cups and saucers. The Queensland Terrace is a partially open venue and subject to weather conditions. With outstanding and uninterrupted city and river views, the River Decks are a special addition to Brisbane’s function spaces. Suspended over the banks of the Brisbane River, this large partially covered deck links to a smaller deck canopied by a sprawling Poinciana tree and offers a magical space to celebrate any occasion. The River Decks are perfect for cocktail style wedding receptions for up to 100 guests or more intimate weddings for up to 40 guests. 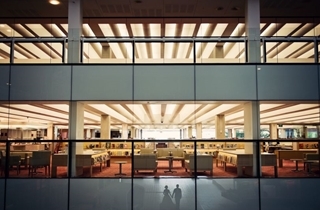 Located amongst SLQ’s collections on level 2, the Poinciana Lounge and Red Box are a spectacular space for your wedding reception with outstanding and interrupted views of the Brisbane River and city skyline. With high ceilings and windows spanning two levels of State Library, the Poinciana Lounge is complete with a grand piano to create a timeless venue for your reception dinner. Dance the rest of the night away in the adjoining Red Box, our stunning glass encased space suspended over the Brisbane River. Tiered wooden seating leads down to the captivating Red Box. Encased in full length windows, this venue gives the impression of being suspended over the Brisbane River. 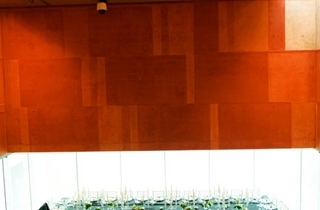 Providing a peaceful, intimate venue against the dramatic river backdrop and panoramic city skyline, the Red Box is a hidden treasure and the perfect space for your small wedding dinner or cocktail reception. 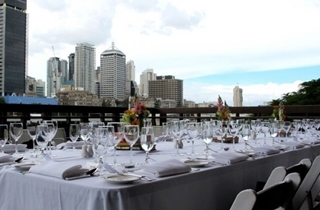 SLQ has nominated a selection of high-quality, reputable caterers to meet the catering requirements of your event. Catering must be provided by one of our preferred suppliers and a list is available on request.